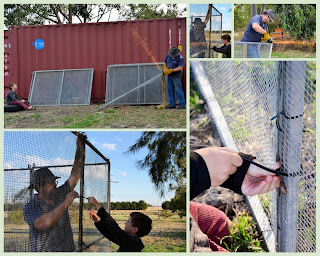 Hamby Home(in)stead ...: Fashioning the "Fox-proof Fowl Fort" (FpFF)! Given our panels were designed to be used horizontally, Nick needed to grind off the metal loops on what would become the bottom edge (when the panels were in an upright position). Sparks flew and it looked quite impressive! We had purchased two sizes of cable ties - 150mm and 250mm. 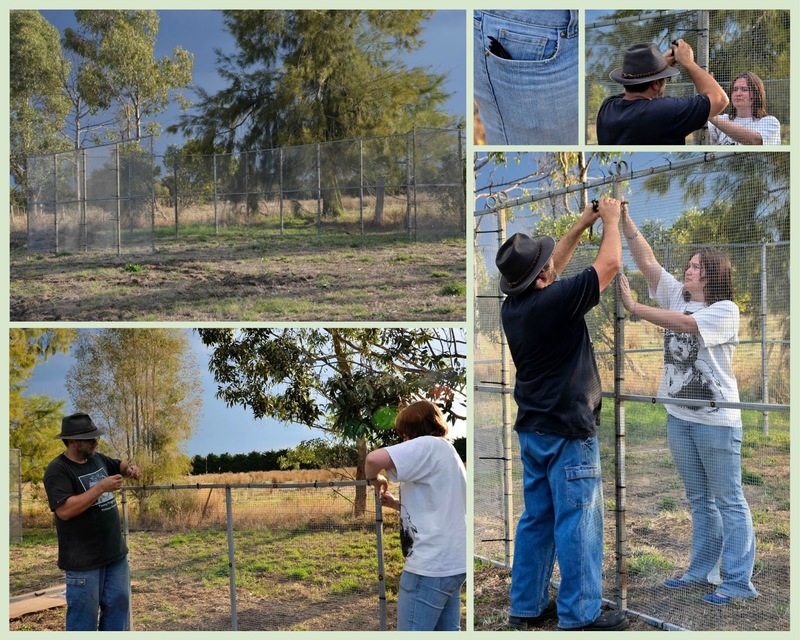 The shorter length ties were used to re-attach the aviary mesh to the frames. Some panels required many ties around the perimeter while others only needed a few. 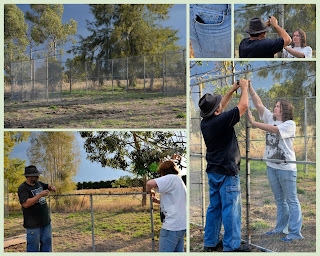 As we had twenty fence panels, Nick planned an enclosure that was six panels long and four panels wide. The larger cable ties were used to join the panels in place - about five or six ties per junction. Nick did most of the work but we all helped at different stages. Some of the last panels required patching of larger holes or mending of split mesh. Fortunately we had some small pieces of similar mesh on-site and could use that for these repairs. I've been researching the recommended space requirements for healthy chickens. Some information is quite detailed, even giving lengths of perch-space per bird! Generally though the consensus is that the more space chookies have, the happier they will be. Five square metres per chook is deemed "adequate" by the Poultry Cooperative Research Centre. When finished, the area of the Fox-proof Fowl Fort (FpFF) will be a little over 34 square metres, which would be suitable for six or seven chooks - so our four girls should have plenty of room!